Possible Winter and Holiday Shipping Delay Please understand that you may experience shipping delays during the winter months due to weather conditions and/or an increase in order volume, due to the holiday season. Please contact us via email at info@primalblueprint.com or call (888)774-6259 Ext. 4110 and a customer service rep will be happy to help check on the status of your order. Q: How do you make your avocado oil? A: First, we cold press the meat of the avocado and we use the fruit that comes from this “first press.” (Note: The remaining fruit is often mixed with hexane and pressed a 2nd or 3rd time and sold as less expensive oil. We ONLY use 1st pressed oil, not the 2nd or 3rd press, and our oil is never extracted with hexane.) After the meat has been pressed, we chill it slightly so the oil will start to separate from the pressed avocado meat. Next, the mixture is passed through a large centrifuge where the pure oil is separated out from the pressed fruit. It requires multiple passes through the centrifuge to obtain pure oil, but the added time is worth it. Think of the centrifuge as a cream separator. Using a centrifuge-extracted process preserves the integrity and high-nutrient content of the oil. Q: Where is your Avocado Oil sourced from? A: We mainly source from Mexico, depending on the harvest and what is in season. Q: I have an allergy, is the avocado oil manufactured in a facility that contains dairy, eggs, or peanuts? A: All of our avocado oil manufacturers are allergen-free with the exception of one. They have crude peanut oil present in their facility, but it is not processed on the same line. This pertains to the 500mL Avocado Oil. 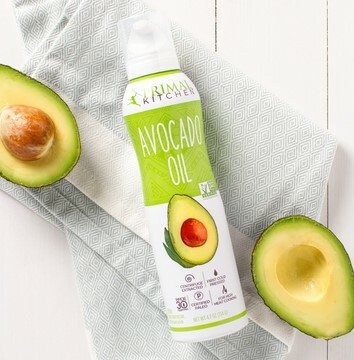 The Extra Virgin Avocado Oil suppliers and manufacturers are allergen free. Q: I see your mayo is Kosher, are your oils Kosher too? A: Yes, our Mayo is Kosher certified. With regards to our other products such as the dressings and oils, we do follow all Kosher guidelines however they are not yet Kosher certified. Q: So, the Avocado Oil is refined? A: Yes, the centrifuge extraction process is refining, but keep in mind that just like coconut oil, not all refined oil is unhealthy. Interestingly, refined avocado oil is even more oxidatively stable than unrefined avocado oil, and this difference in stability comes primarily down to the difference in chlorophyll content. That is, the chlorophyll in unrefined avocado oil—it’s what makes it green (and admittedly attractive)—reacts with light to form oxidation products. Refined avocado oil, which is a pale yellow bordering on clear, contains almost no chlorophyll and shows essentially zero traces of oxidation—0.1% free fatty acids (in order to qualify as “extra virgin” in the eyes of the International Olive Council, olive oil must register below 0.8%) and a peroxide value of 0.1 mEq/kg (the IOC demands less than 20 mEq/kg of its extra virgin olive oils). With a neutral flavor, a similar fatty acid profile to olive oil—70% MUFA, 12% Omega-6 PUFA, 1% Omega-3 PUFA, 12% SFA—and a smoke point suitable for high-heat cooking, refined avocado oil can be a useful addition to your primal kitchen. Verdict: Primal, so long as you’re using expeller-pressed refined avocado oil. Q: How does the centrifuge extraction (refining) give it a higher smoke point? A: Think about the oils being pressed from the flesh of the avocado - it still contains fatty compounds and a little bit of that flesh at the end, which if heated too high, will start to smoke. That is why the Extra Virgin has a lower smoke point, because of those extra particles. If you bottle it right away, you have a cold-pressed, or "virgin" oil which retains its natural color and flavor. The refinement is separating the pure oil from the flesh and the particles. The purer the oil, the more neutral the flavor, and the higher the smoke point. Basically, the refinement process is designed to extract the more heat-sensitive components from the fat in order to raise the smoke point. Q: What is the Vital Fat composition of Avocado Oil? Q: Are your avocado oil heat and light stable? A: Yes! Our avocado oil is naturally heat-stable and is protected from the elements in a beautiful dark glass bottle. It has a smoke point of 520 degrees. Q: What is the shelf life of your avocado oil? A: It's good for 18 months unopened. Once opened, we recommend using within a year. It does Not need to be refrigerated.